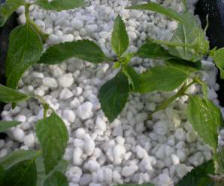 Perlite makes a great hydroponic planting medium due to its light weight, porosity, and inert nature. 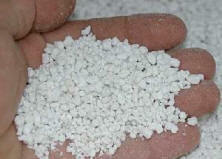 Perlite is made by heating silica (flakes of glass) until it expands (like popcorn). Due to its low density and relatively low price, this substance is used in lightweight plasters and mortars, insulation, and ceiling tiles. The small nodules hold water well, yet also provide excellent drainage in horticulture. This medium keeps plants more open to air, while still having good water-retention properties, and therefore it makes a good medium for hydroponics. It is often used as a filler and mixed with heavier media to help improve drainage. 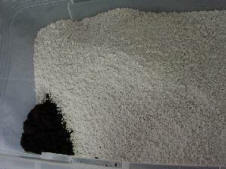 However, you can actually grow hydroponic plants in a bucket system using nothing but perlite! Advantages: Reusable; inexpensive lightweight filler. Disadvantage: Cannot be used alone for ebb & flow, as it tends to float away or move during the flooding cycle. Tip: Do not order this medium mail order. 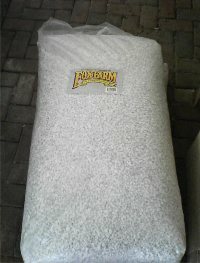 You can get a giant bag of it cheap at Home Depot or the garden center. I paid $13 at Home Depot for a 4 cubic foot bag (16 lbs). This was enough for a 24 pot setup!